Cody Deaner has been a professional wrestler since 2000. He has wrestled all across North America for the largest companies in the USA and Canada, including World Wrestling Entertainment (WWE), Impact Wrestling (formerly TNA - Total NonStop Action Wrestling), and numerous independent wrestling companies. Cody has won dozens of championships all over North America and wrestled with or alongside some of the top Superstars in the wrestling business, including, Jake "The Snake" Roberts, Ricky "The Dragon" Steamboat, Rey Mysterio, Kurt Angle, Kevin Nash, Booker T, AJ Styles, Dean Ambrose, Jeff Jarrett, Bobby Roode, Eric Young, Scott Steiner, Luke Harper, "The Perfect 10" Tye Dillinger, and many others. "You can be whatever you want to be... if you put in the work!" "Positive motion creates positive emotion." "We all have the power of influence." "Don't let the size of your town dictate the size of your dreams." "Cody was one of the most impactful speakers I’ve heard! His ability to quickly connect with the students, hold their attention, and keep them engaged for the entire hour was most impressive. His message of going for a goal, working hard to get it, and helping others along the way is one our students will not forget! Cody is a ‘must-see’ for any student." Cody Deaner - "Giv'er for Charity"
In early 2018, Cody Deaner decided he wanted to give back to the multiple Canadian communities he has visited throughout his career. To give back, Cody started "Giv'er for Charity." ​"Giv'er for Charity" is a fundraising campaign aimed at raising money for a variety of amazing Canadian charities. Cody partners with various charities who are in need of funds and want to increase the awareness of their cause. 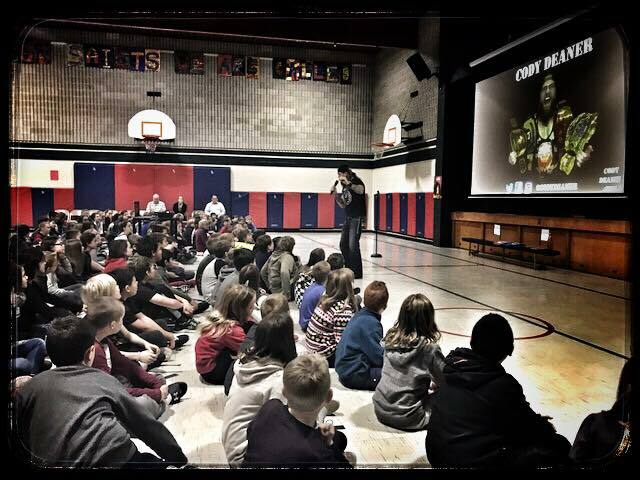 Cody helps them raise money by selling merchandise at his professional wrestling events and speaking engagements. Cody then donates 100% of the proceeds to the charity of choice. Charities are chosen by Cody Deaner's extremely loyal fanbase, or Cody chooses the charity himself because the organization has a unique connection to a particular fan who has directly impacted Cody in a positive way. "The Deaners" - Cody Deaner & Cousin Jake on iMPACT Wrestling! Cody Deaner is available for wrestling bookings worldwide. Come and support and watch Cody Deaner at an event near you! To see where Cody will be wrestling next, click HERE.